racle Receivables is not an easy module to set-up. 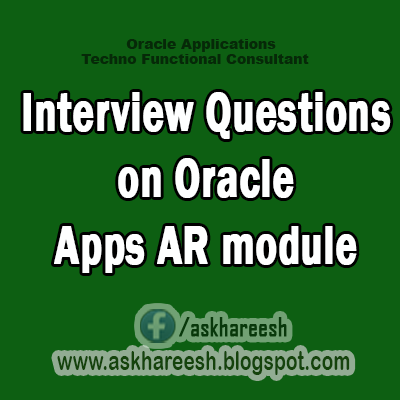 To crack the interview is bit more tedious.Below are some of the Functional questions pertaining to Oracle AR module. Just go through them and brush up your skills. 1. How many Address's can have one Customer? 2. Customer Number Always Automatic / Manual? 3. What are the Mandatory Address's you should create a Customer for Communicate him? 4. Can U Merge the Customers? If How? 5. What is Accounting Rules? 6. What is Invoicing Rules? The Invoicing Rules Helps you when you receive data from Outside systems like Auto Invoices how the data should insert and It contains 2 rules Advance Invoice, Arrears Invoice. 7. Where should the customers send the payments of Invoices? 8. What is the Transaction Type? It describes us Whether you want transfer the Receivables data into General Ledger or not. And also when ever you create an invoice what are the accounts should be effected and also the sign of Transaction also. 9. What is a Transaction Source? 10. How many Transactions we have? 11. How can i reduce the Invoice amount? 12. What are the Accounts to be use in Transaction Types (Few)? 13. How can i Assign a Deposit amount to an Invoice? 14. What is the Guarantee? 15. Give the Navigation for Credit Transactions? 16. How many ways you can apply the Receipt Amount? 17. How will you know a Customer Balance Amount? 18. Can U Define Customer Agreements using with AR? 19. What are Aging Buckets? 20. How will U View the Outstanding Balance of a Customer?